Way back in 1652 the VOC or Dutch East India Company as it was known decided to establish a refreshment station at the Cape to provide fresh food and meat to its ships on their way from Holland to the east. Jan van Riebeeck was chosen as the first commander of the Cape and was given the task with his gardener Hendrik Boom to establish a garden on the shores of Table Bay. It soon became apparent to van Riebeeck that to manage a large garden he needed a large labour force. To begin with he tried to use the local Khoi people but that was unsuccessful as they refused to work for the VOC. The small labour force that had arrived at the Cape with van Riebeeck was unable to cope with all the work that had to be done so Van Riebeeck had no option but to request more people to be sent to the colony to help him . The executive council, "The Heren XVII " who controlled the VOC established the colony at the Cape for only one reason and that was to make a profit. Sending more men to the Cape would have dented their profits so another source of labour had to be found. The VOC had an ace up their sleeves and that was slavery. In the early 1600's they had introduced slave labour into the nutmeg plantations on Amboina in the East Indies and later into all the other VOC settlements. Van Riebeeck was aware of this so when it was suggested that slave labour be introduced into the Cape he regarded it as an acceptable way of obtaining labour. The first slaves to arrive at the Cape were shipped to Cape Town on the ship "The Amersfoort" one of a fleet of ships owned by the VOC which were used for transporting slaves. The slaves had originally been captured in Angola by a Portuguese slave trader and were en route to Brazil when the Dutch captured them and brought them to Cape Town. 250 slaves were captured but only 170 of them survived the sea voyage to the Cape. Although the first slaves to arrive at the Cape came from West Africa the VOC changed its policy and later imported slaves from the east coast of Africa, from places such as Mozambique and Madagascar and India and Batavia. On arrival in Cape Town the slaves were put to work in the Company gardens by the VOC. Accommodation of the slaves was a problem so in 1679 the slave lodge was built to accommodate them. 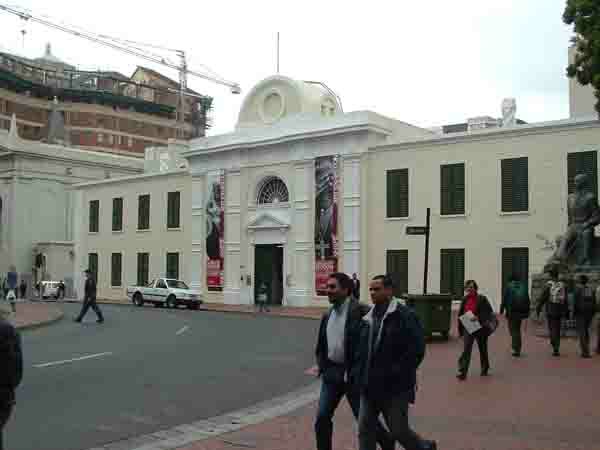 The old slave lodge buiding has survived its chequered history and is today the second oldest building in Cape Town and now houses the South African Cultural Museum. Over its 132 years as a slave lodge it was home to as many as 9000 slaves. At first the slaves were owned by the VOC but as the settlement at the Cape grew slaves were sold to farmers to assist them on their farms. As the slaves had very few rights they could be sold at the whim of an owner and be transferred to the purchaser without being compensated or even asked if they wanted to go. Slaves were subject to some very strange rules and I'll list a few of them below. All slaves had to be indoors by 10 pm and if they were not had to carry a lantern if they were on the streets. They were not allowed to ride on wagons and horses in the street. Slaves were not allowed to gather outside the entrances of church buildings during services. They were also not allowed to stop and talk to other slaves when out on the streets. Slaves were not allowed to be cheeky to any slave owner in public. As one can see from the above their lives were difficult and restricted. One of the main hardships endured by the slaves was that it was extremely difficult for them to have private lives. They were not allowed freedom of movement and rights that were accorded to other members of society. The slaves, including young children, were cruelly removed from their families and when they were sold had to face life on their own in a foreign environment. Some slaves were sold more than once and each time had their names changed by the new owner. Communication was another problem as slaves came from different parts of the world and spoke different languages. On arrival at the Cape they were thrown together and were expected to understand one another and the Dutch. Family life was more or less non existent for the slaves as on arrival some found themselves alone on a farm with only the farmer and his family while others were placed into groups of slaves with different cultural backgrounds. With restrictions on movement it was difficult for them to meet each other and as the farmers preferred males to females it was also difficult for slaves to find female company. Marriage between slaves was not allowed so that an owner if he wanted to could split life partners and sell one of them to the highest bidder on auction. It often occurred that life partners were owned by different owners and the couples then had to rely on the goodwill of their owners to be able to see each other. The authority of owners of slaves who had children often caused disputes as the slave owner disregarded the authority of slave parents over their children. As slavery was practised all over the world the plight of slaves started coming to the fore in the late 1800's when people in Europe started campaigning against slavery and the suffering of slaves. In the Cape slavery was accepted as normal practice and the idea of the slaves being freed upset the locals as they deemed it their right to own them. The owners of the slaves also complained that to release their slaves would cost them a lot of money. This however did not stop the movement toward freeing slaves. . When the British arrived a the Cape in 1795 they brought with them the growing concept of human rights. Unfortunately the British were forced to hand the Cape back to the Dutch but they once again took control of it in 1806 at the Battle of Blaauwberg. Eventually after a long struggle to emancipate the slaves the British Government outlawed slavery at the Cape in 1834. This however did not end slavery as slave owners were given four years to apprentice their slaves and teach them skills before their eventual release in 1838. Unfortunately many owners ignored the terms of the law and their slaves continued to work under the same conditions as before. After eventually gaining their freedom many slaves continued to do the same work as before but on different farms as they had no other skills. Those slaves whose families had been split up went in search of lost family members and some were succesful in tracing them. Unfortunately for the slaves freedom did not give them the same rights as their former owners and they continued to live under the tight control of the authorities. As the British tightened their control over life in South Africa the laws that had been instituted by the Dutch to control their slaves were amended to include all Black people and people of colour living in South Africa. When eventually in 1948 the Nationalist party took over control of the SA government many of the laws that were there prior to their take over were enforced and apartheid came into being. Apartheid was nothing new in South Africa as it had always been practised by whoever was in charge at the Cape and later in the Union of South Africa. Unfortunately for South Africa, laws that were being relaxed elsewhere in the world were enforced here and it was that fact that raised the ire of the world causing South Africans to become the pariahs of the world. Fortunately politicians after much pressure from the outside world eventually came to their senses and in 1994 an election where all the peoples of South Africa could vote was held and the first truly representative government was elected. Today the South African rainbow nation is growing in leaps and bounds and we invite people from all over the world to visit us to see the changes we have made since 1994. Below is a list of places that people can visit and trace the history of the slaves in the Cape. The Malay Quarter and the Bo Kaap. 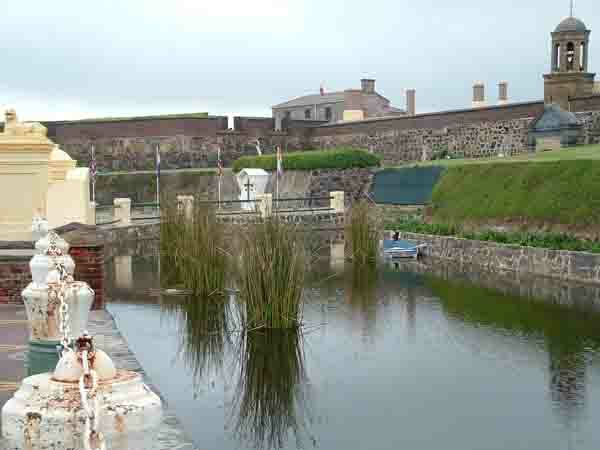 The Castle of the Cape of Good Hope. Slave bells and slave quarters which can be found on various farms around the Peninsula. 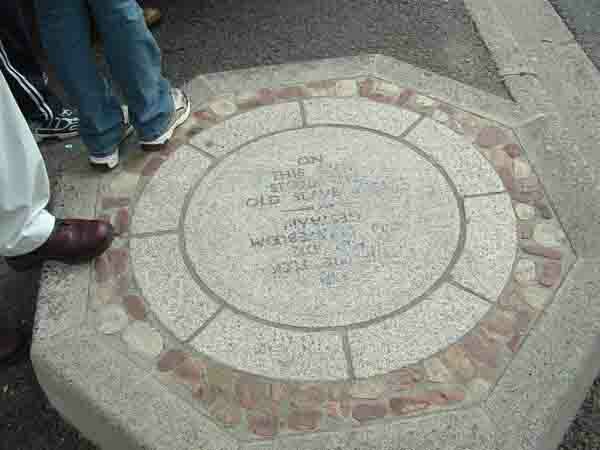 Commemorative plaque of the slave tree in Spin street. Various churches scattered around the Peninsula as well as Kramats and mosques and mission stations that assisted the slaves in the Cape.